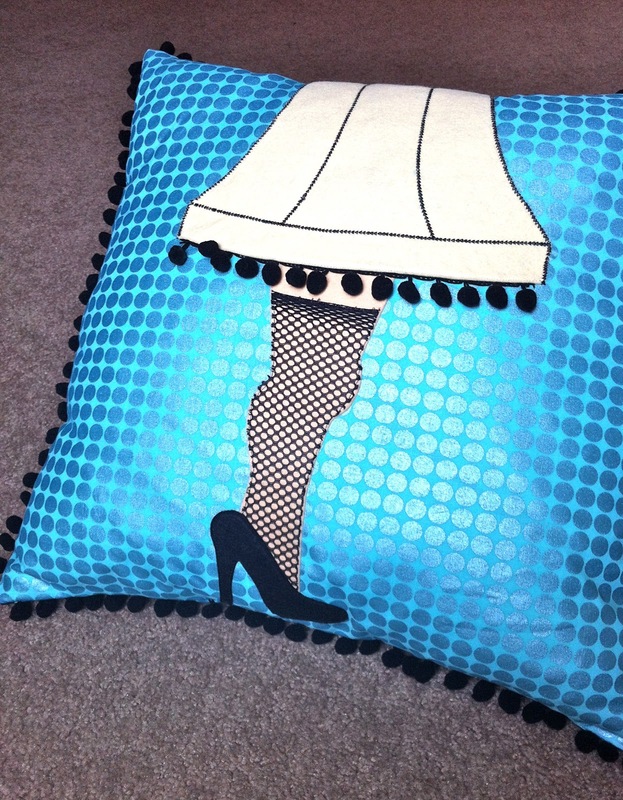 You had to expect a leg lamp would work it's way in to my Christmas movie projects, right? Small amounts of felt in peach, black, and another pale color. Print the templates: Lampshade and Leg/shoe. 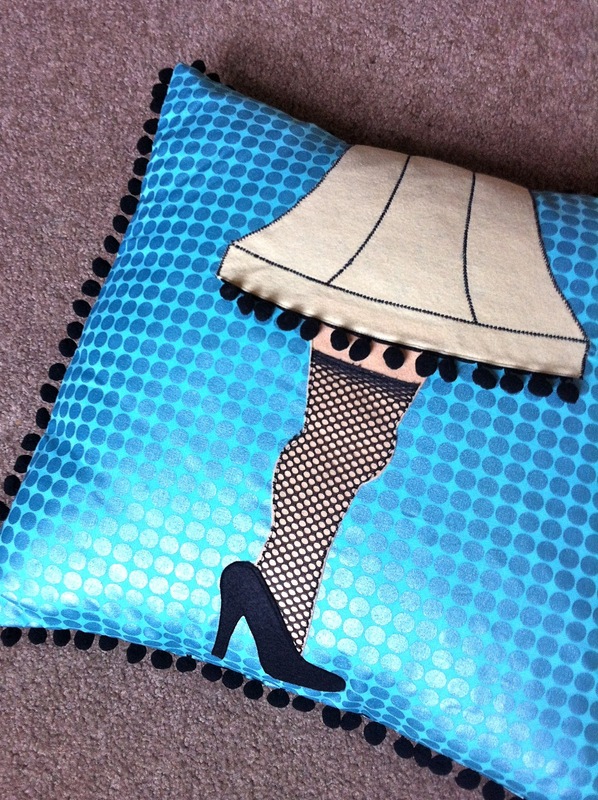 You can easily print the shapes smaller for a smaller pillow size or other project. From main fabric, cut one piece 18.5" square, and 2 pieces 18.5" by 13"
The easiest way to cut the felt is to trace the shapes backwards onto the paper side of the fusible web. 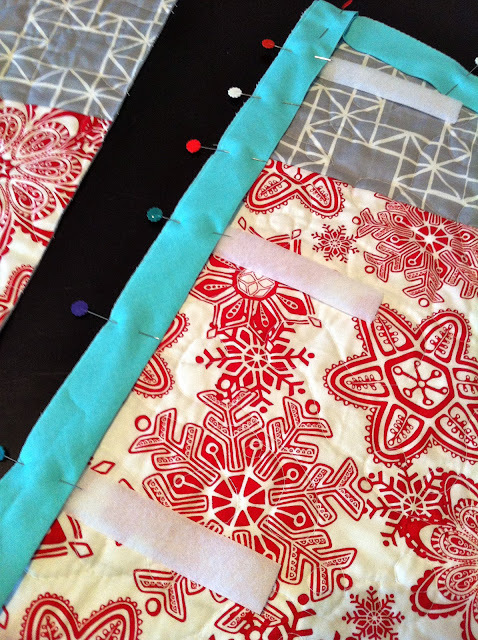 Fuse it on the back of the felt, then cut it out and it's ready to fuse onto the front of the pillow. Fuse the leg piece first and stitch it down with light thread. Then cut a piece of the netting out with the leg pattern piece, but end it lower than the top. pin down the netting (can't fuse it) and then fuse the shoe on top of that. Remember the shoe is meant to overlap the bottom of the leg piece some. 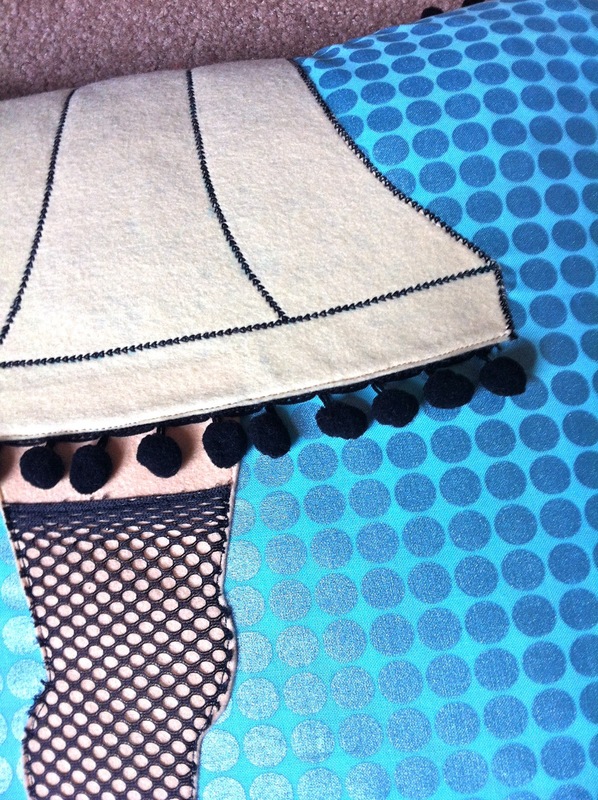 Stitch around the shoe and netting with black thread. 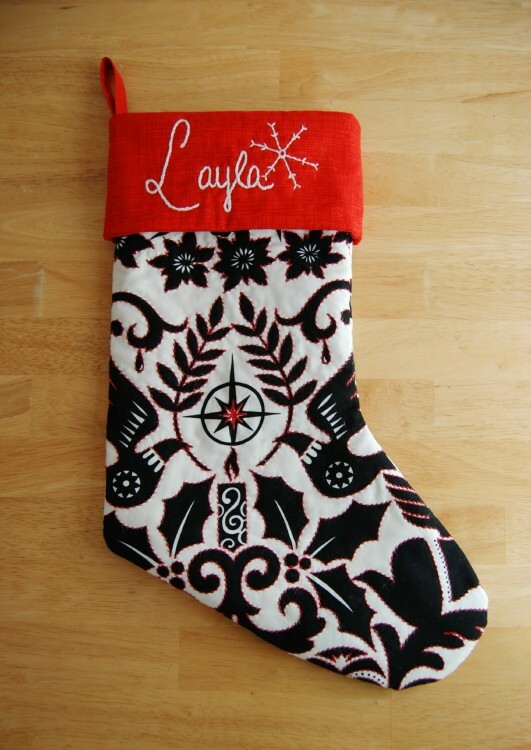 The netting I got is thicker at the selvedge, so that's what I used for the top of the stocking. 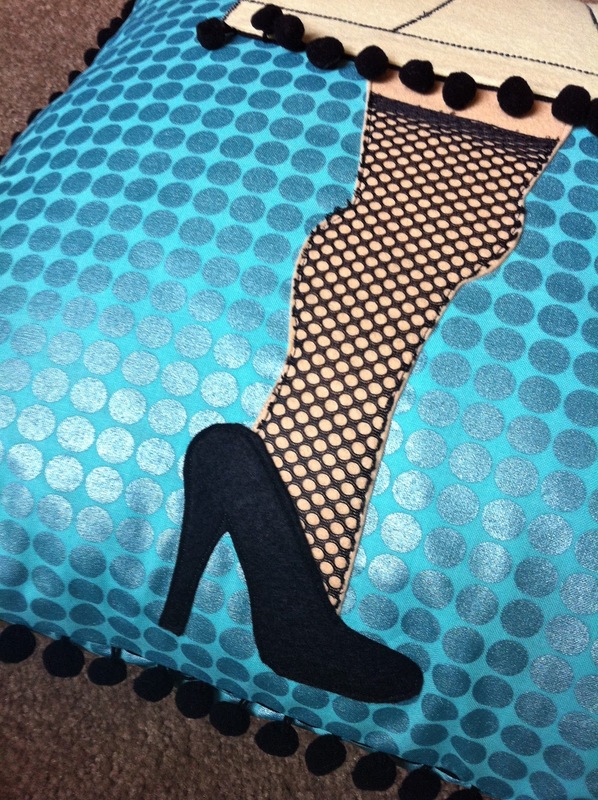 But you could add some thicker decorative stitched there for the garter look. Now fuse the lampshade piece, overlapping the top of the leg a little bit. Remember to cut a piece of ball fringe as long as the bottom of the lampshade and stick that under before fusing and stitching. I added the seams on the shade with a decorative stitch on my machine. You could also do this with hand stitching, but I figured this was one of those rare times to use those machine stitches I never get to. Draw the lines on first with a water soluble marker. Now you are ready to put the pillow together. 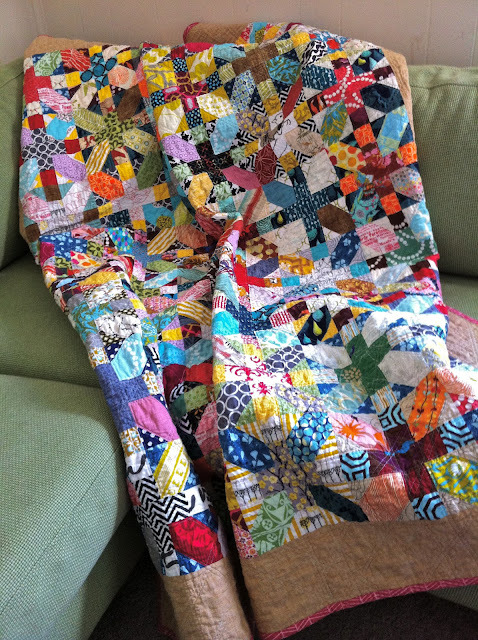 On both back pieces, hem one of the 18.5" sides by folding under 1/2" twice and stitching along the fold. Now place the back pieces on top of the front, right sides together, lining up the raw edges all the way around, and overlapping the hemmed sides in the middle. The ball fringe should be sandwiched on the inside. Stitch around with a 3/8" seam allowance, getting close to the balls but not sewing over them. Clip corners, turn, and you are done! 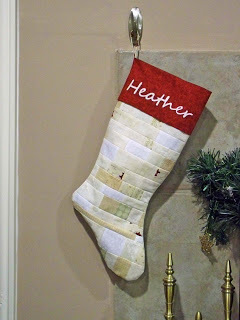 So much great inspiration to get you crafting early for Christmas. 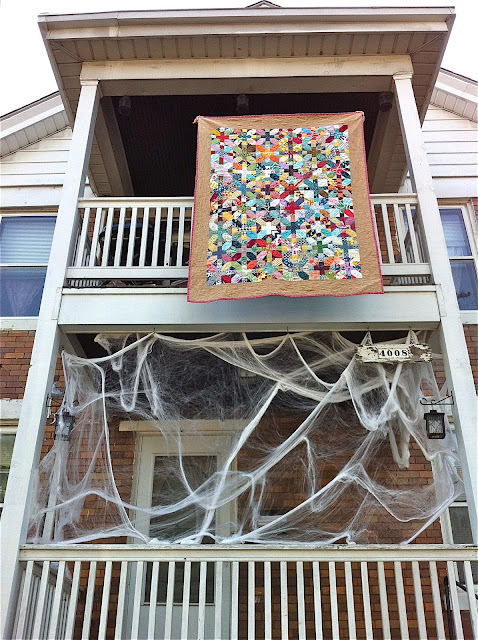 Be sure to add any projects you make inspired by ours to the Holiday Craft Bash flickr group. There's a good chance you could win some fabric prizes! Admittedly, I was not a Hitchcock fan before Kristin and Jessica wanted to do a special Hitchcock edition of FP for Halloween. I just hadn't watched any of it before. But now I get it. I've been eating up episodes of Alfred Hitchcock Presents all week long. Such a strange and interesting genius, and completely entertaining storyteller. 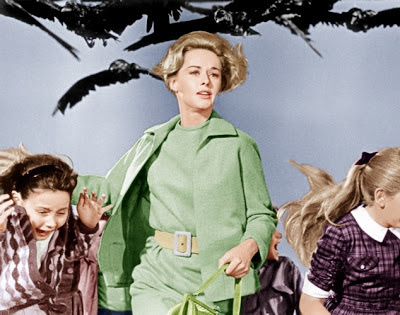 If you haven't seen it, The Birds is the tale of Meredith Daniels who follows near stranger Mitch Brenner into the town of Bodega Bay, California. And then birds start randomly attacking everyone. They flock the town, join forces across species, and just cause general mayhem and confusion. The movie is vague until the very end about why this is all happening, which really just adds to the charming Hitchcock creepiness. 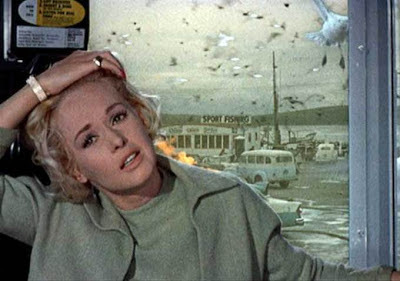 I was inspired by the Daniels character, played by Tippi Hedren. She's beautiful, she's blonde, and she is the best kind of 1960's overdramatic. The way Hitchcock scenes all end with those horrified expressions and fingertips in the mouth- she perfected it. I just love the minty green suit she wears through most of the movie and I wanted to create a modern kid version of it for Elsie. The coat and the skirt are both made with light green fashion suiting from Joann and a Kokka Trefle Japanese print called County Fair that I got at Whipstitch in Atlanta over the summer. It's absolutely the perfect lining with that green color, and also a small nod to another Hitchcock film- Strangers on a Train. 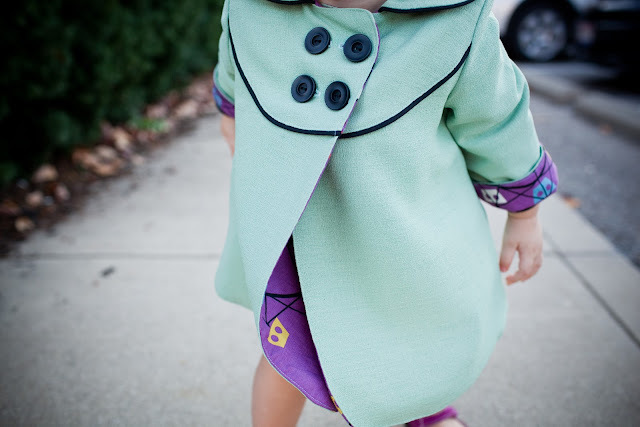 For the coat I used the Dear My Kids Stylish Coat pattern, which was great. I made a size 2, but cut about an inch and half off the bottom, and it fits perfectly. I added the black piping, which adds such a great pop to the muted green. I always say, piping makes everything better. 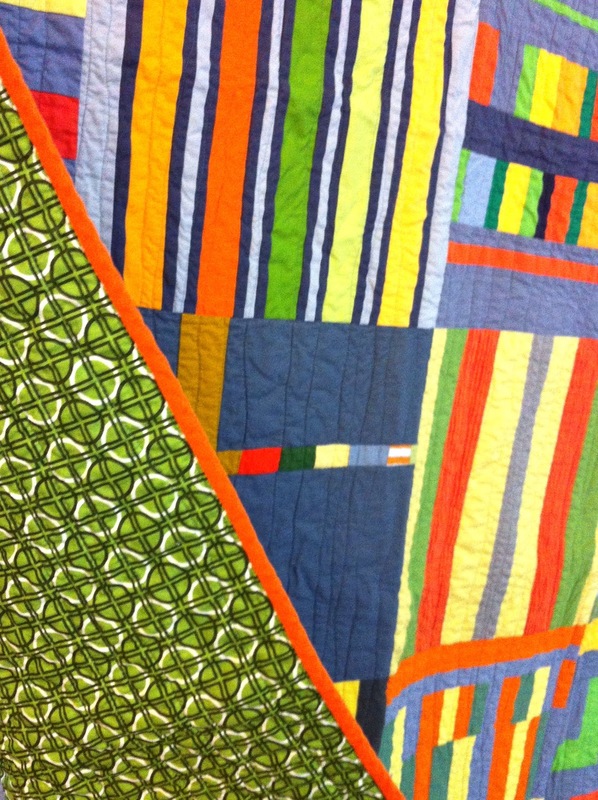 I also added a layer of flannel for interlining, just to make it a little warmer. 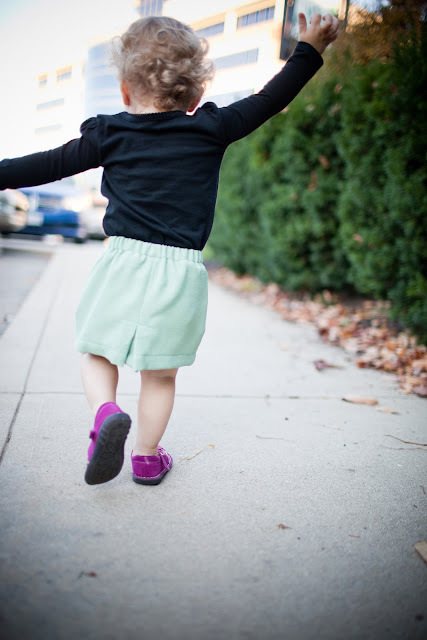 The skirt is the Oliver & S Sailboat skirt. Why haven't I made this before? I love it, it will be so cute with tights this fall. (It was 80 here yesterday when I took these pictures!) The suiting is a little flimsy so you can see the front facing through it, but I still love the shape and the peeks of that fair print on the side panels. 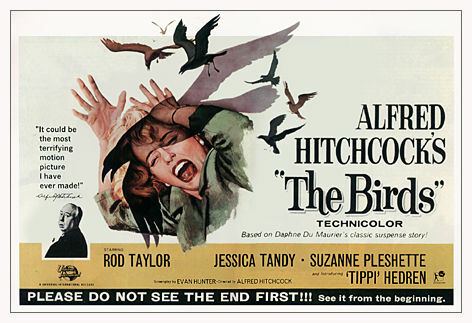 In one of the most memorable scenes, Tippi is caught in a phone booth while the town is under bird attack. They are diving and pecking at her and the cheesy effects are just fantastic. They are swarming... Can the different species really be flocking together? How will I ever get out of this death box? Run for it little Tippi! 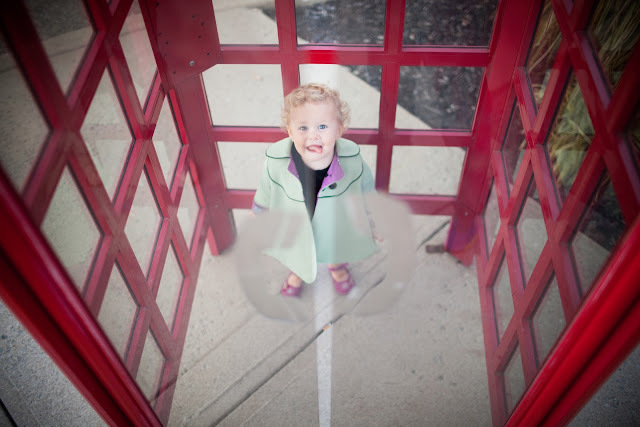 I had a more creepy feel in mind for this photo shoot, but my girl wouldn't stop smiling the whole time! Can't complain too much about that cheesy grin though. We'll work on her Tippi faces. Kristin's photos this time around nail the creepy/cute combination for sure. Her post is SO much fun and you can't miss her tribute to Psycho. And Jessica from Running With Scissors knocks it out as our guest this time. 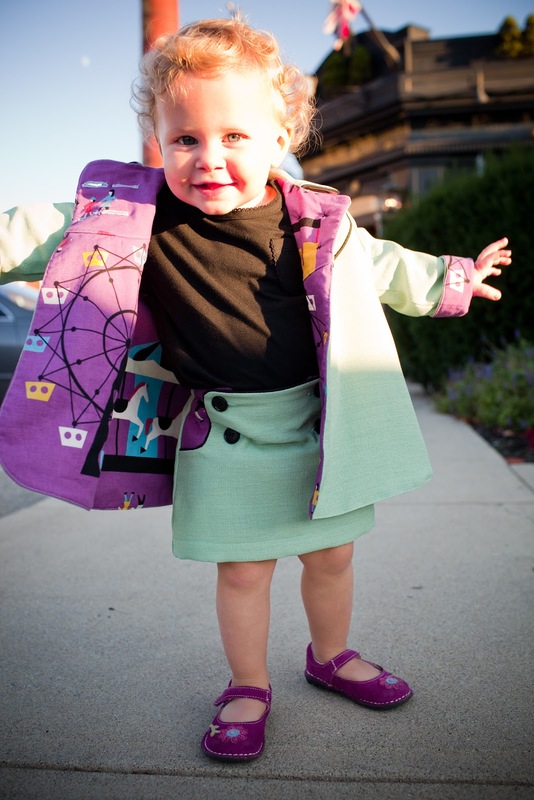 She does her take on the Birds with a boy outfit, and her RJ is quite the little actor. You have to go see! 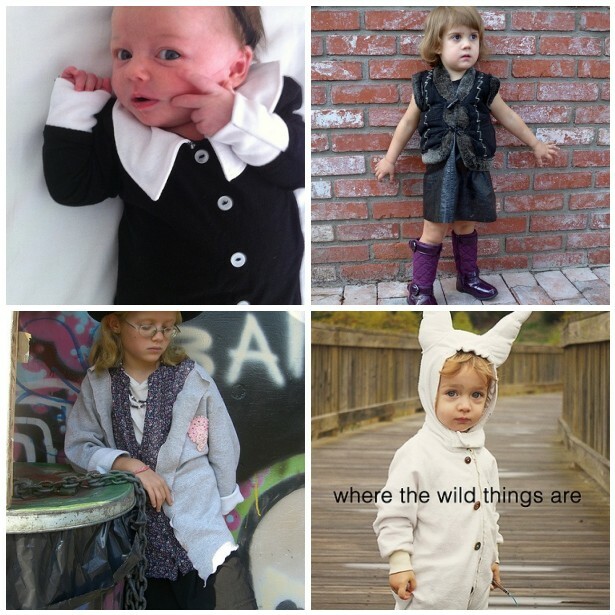 Lastly, don't forget to add any movie-inspired kids clothes and costumes to our Film Petit Flickr group. Another Monday, another Christmas tutorial! This is part of the Holiday Craft Bash I'm participating in with Meredith, Jacey and Debbie. 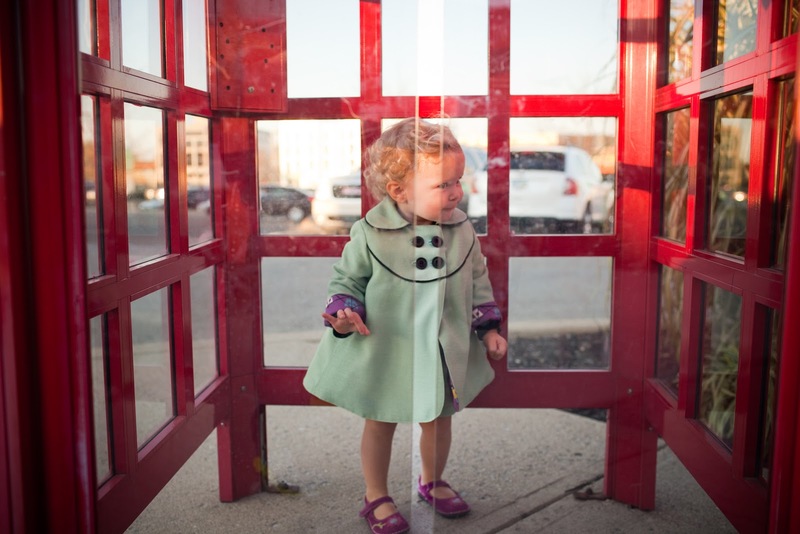 Each week, you get to see a new inspiring Christmas project done 4 different ways. And you can add your own projects to the Flickr group for a chance at great prizes. And the best part is, we'll all have some GREAT decorations done before the holiday rush starts! I've been working on this all week and have been SO excited to share it with you. Elf is like a new classic in the Christmas movie category. It's a must-watch in our house every year and we quote it all season long. 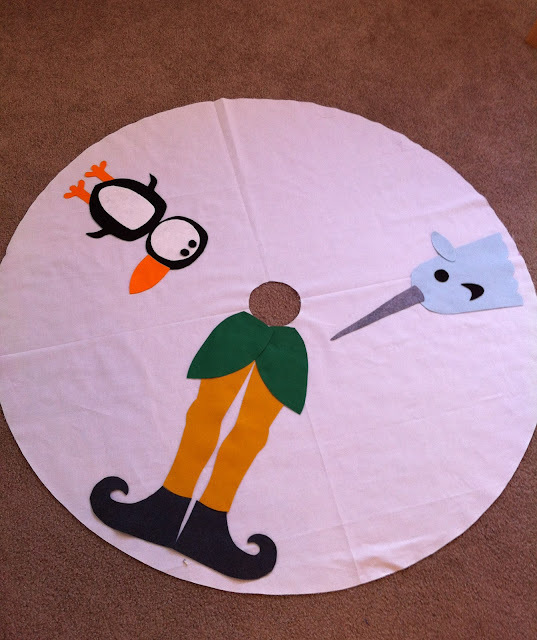 My kids love this tree skirt and I can't wait to introduce them to Buddy the Elf again this December... or maybe even sooner. 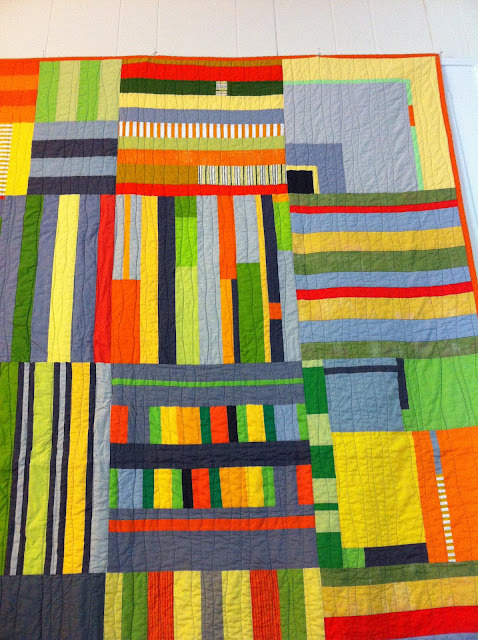 This tutorial takes a few things for granted quilting wise. 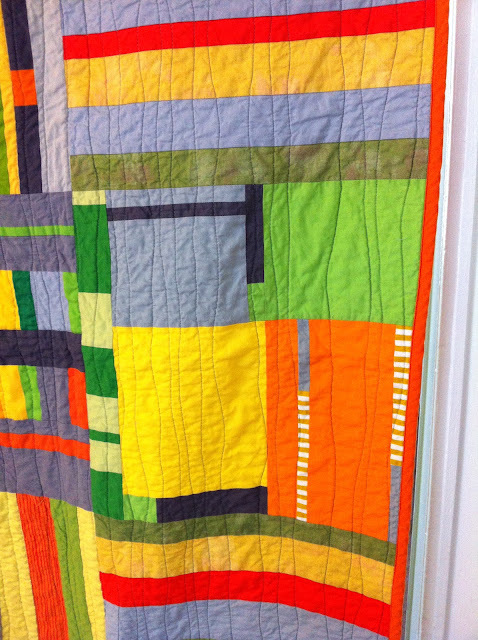 You should know how to do machine appliqué and how to baste, quilt and bind your project. 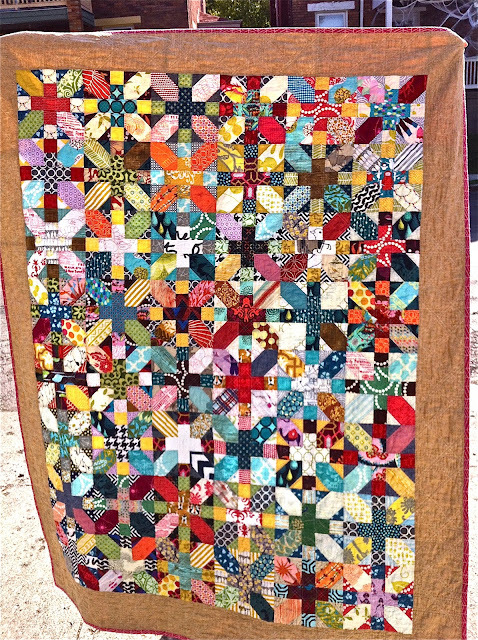 However, if you aren't a quilter, you could easily simplify this project by making the base of your skirt out of a large big piece of felt rather than quilting cotton. 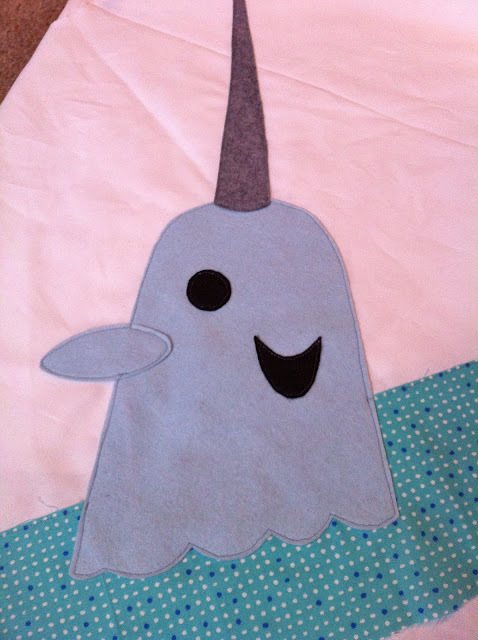 Then you can do the appliqué part with my patterns and you won't have to quilt or finish the edges of the felt in any way. Or you could even use the patterns to make a set of Elf stockings for your family the same way I made my Bumble stocking from last week. Lots of possibilities. Small amounts of wool blend felt in light blue, gray, green, golden yellow, black, white, and orange. I cut my felt pieces by tracing the pattern shapes on freezer paper. 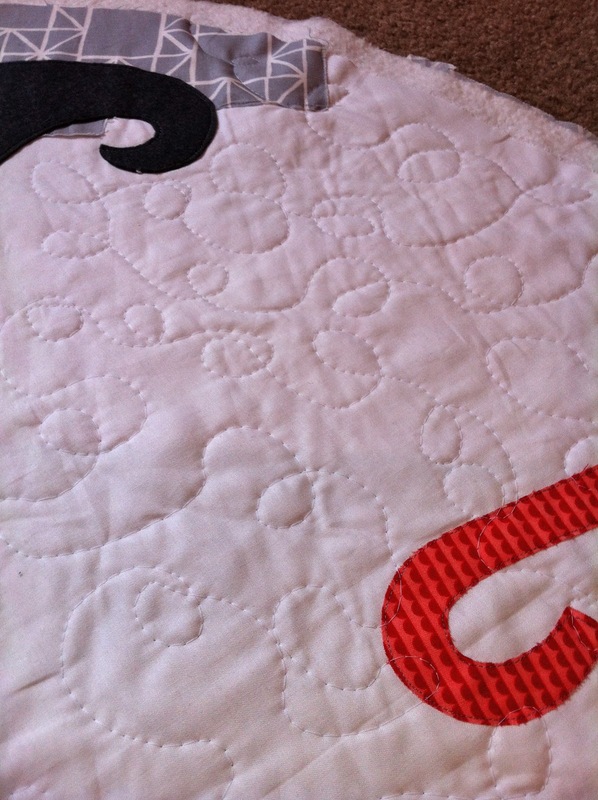 You could also trace them directly on to the wrong side of the felt and then cut. I sprayed my felt pieces in place before stitching them down, and used the fusible web only on my quilting cotton pieces. Cut your tree skirt top by taking your 1 1/4 of white, folding it in half selvedge to selvedge, then in half again so that the cut edges meet. Now it should be folded into four layers. 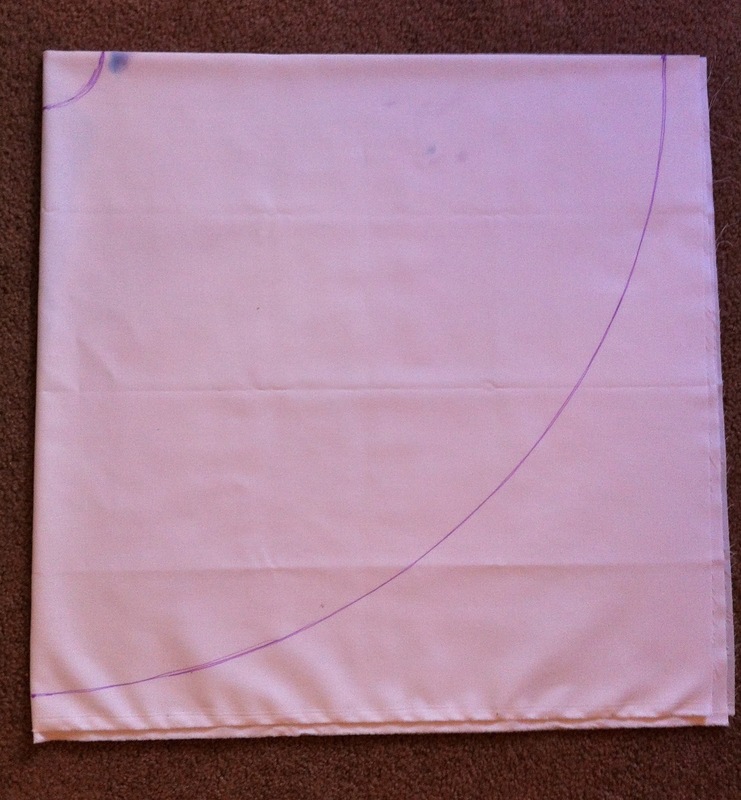 From the corner with both the folds, measure 2 inches from the corner on both sides and mark with a marking tool. Then mark again on each side at 21" out from that same corner. Tie your marker on some string and use it like a compass to connect both these markings to each other. 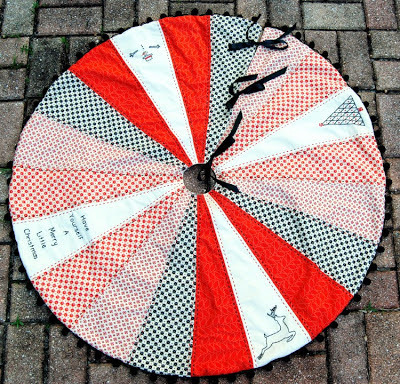 So you will hold one end of the string at the folded corner, then start with your marker at the top marking and connect it in a curve to the corresponding mark on the other side. Your lines should look like mine above, with the folded corner at top left. (Ignore the chalk marks my kids decided to add, that side just became the back!) 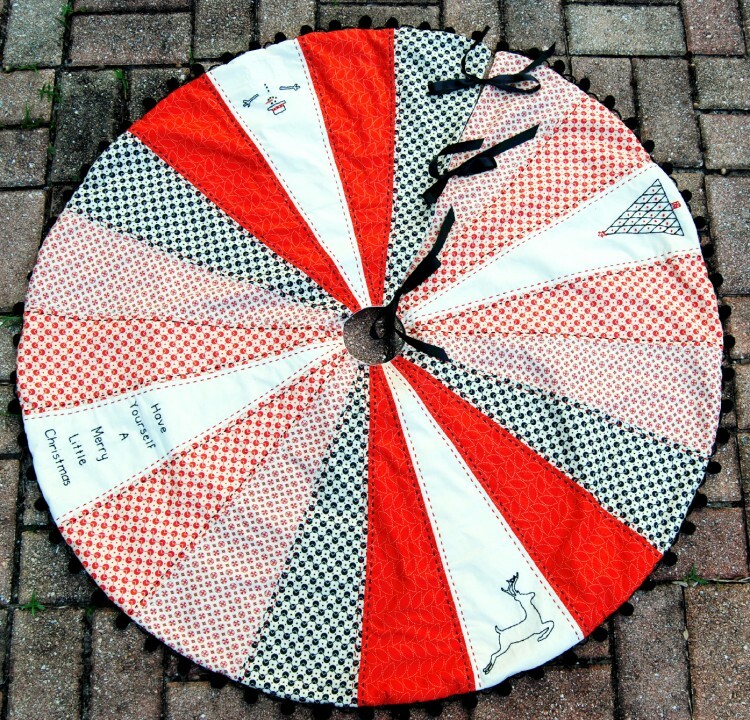 Cut along both of these curved lines and when you unfold the fabric, you will have a full circle with a hole in the middle. 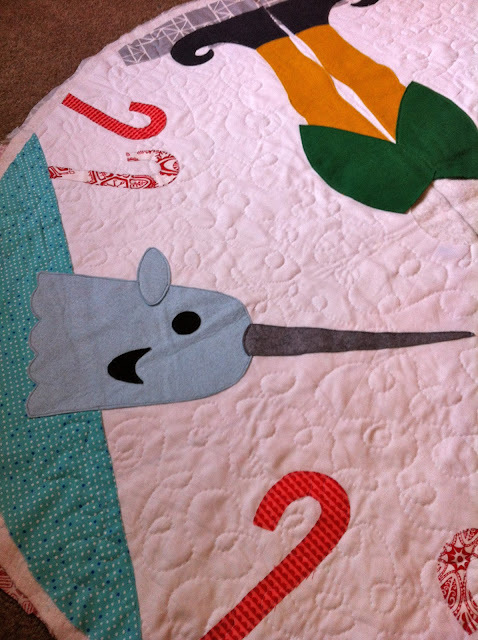 Arrange your Buddy, Puffin, and Narwhal pieces. You want to leave a large space on one quarter of the circle where we will put the opening later on. Add the candy cane appliqués with fusible web last. I did 8 candy canes, randomly placed around the circle. Now that all the pieces are in place, it's time to baste and quilt everything. 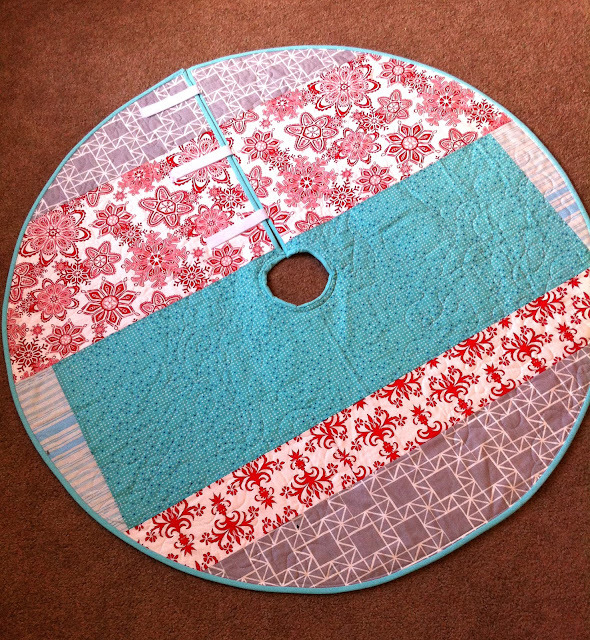 Do not cut a circle out of your batting and backing fabric because it will be too hard to line up everything. Just baste the top circle to squares of the batting and backing that are big enough to cover it, then you can trim around the edge, leaving an inch or two for shifting. 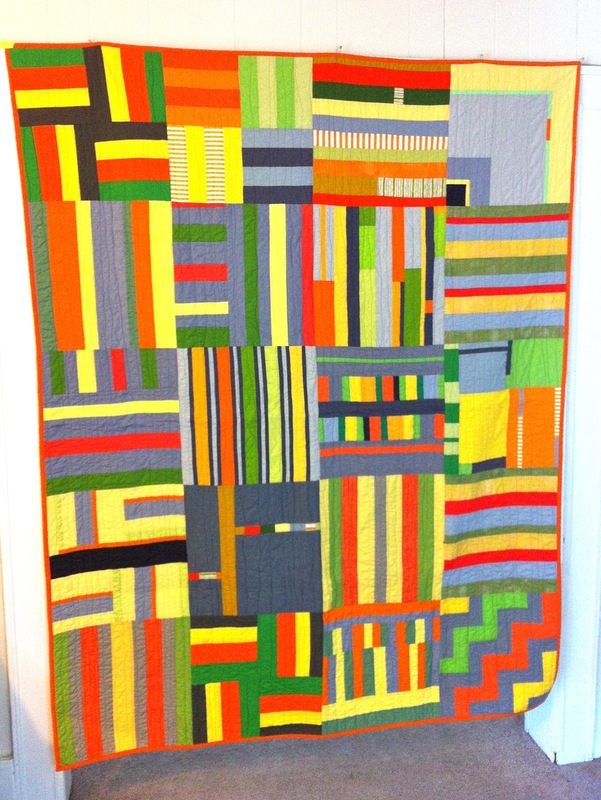 I used this as a chance to practice a little free motion quilting. I made swirls all over the white space in white thread to look like blustery snow flurries. 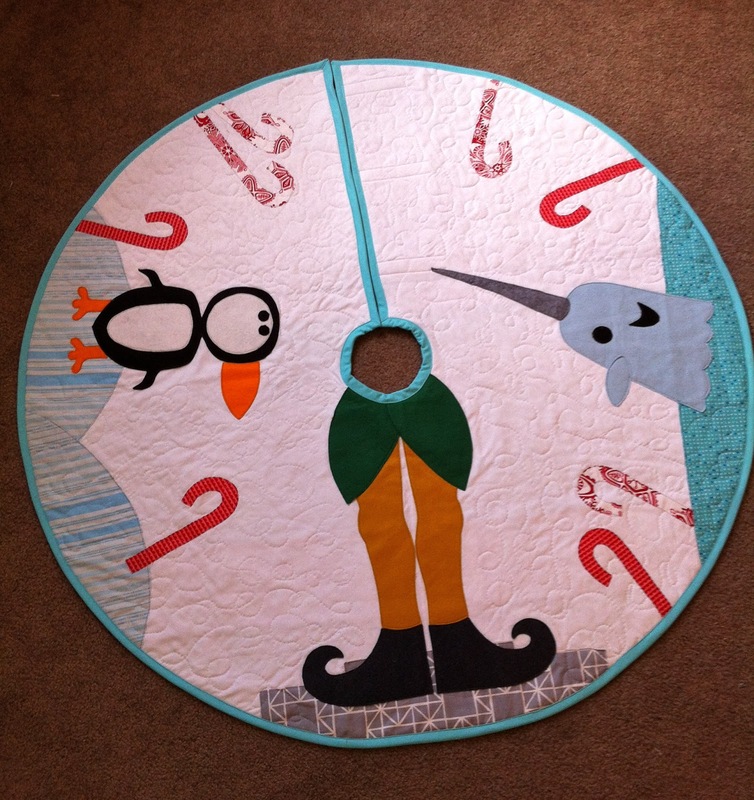 I didn't quilt at all over the felt pieces, but since this is a tree skirt and not a quilt, I think the un-quilted areas aren't a problem. I'm pretty happy with how it turned out... except for the fact that I forgot to turn up my tension until I was mostly done, so the back doesn't look great. Good thing no one sees the under side of a tree skirt. 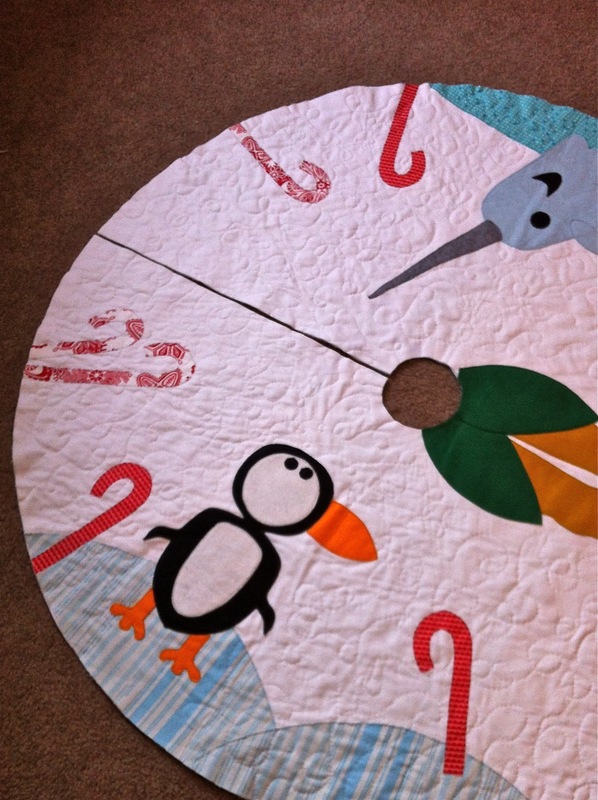 After quilting, cut away the excess on the outside of the circle. Draw a straight line in that open space from the outside to the inside and cut it open, then cut out the inside circle as well. Definitely looks like a tree skirt now, we just have to finish it off! 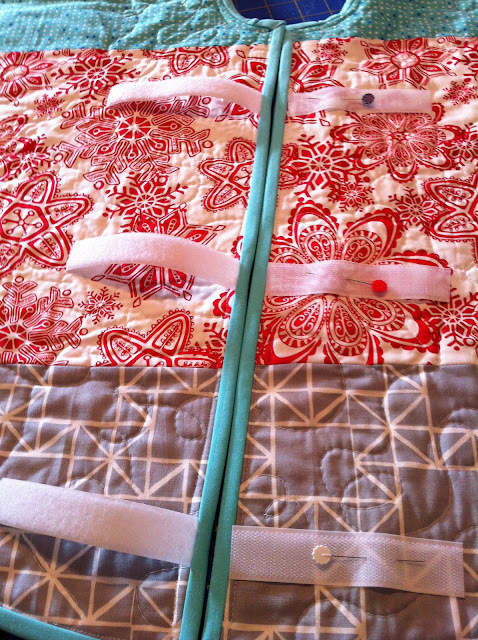 Sew your bias binding onto the back first. On one side of the opening, pin three 5" pieces of the soft side of velcro under the binding, lined up with the raw edges. Pin them so the fuzzy side is facing up when looking at the back of the tree skirt. After attaching the binding to the back all the way around, bring it the front and pin, making sure you fold the velcro pieces out so you don't sew over them again. Top stitch the binding all the way around on the top side. 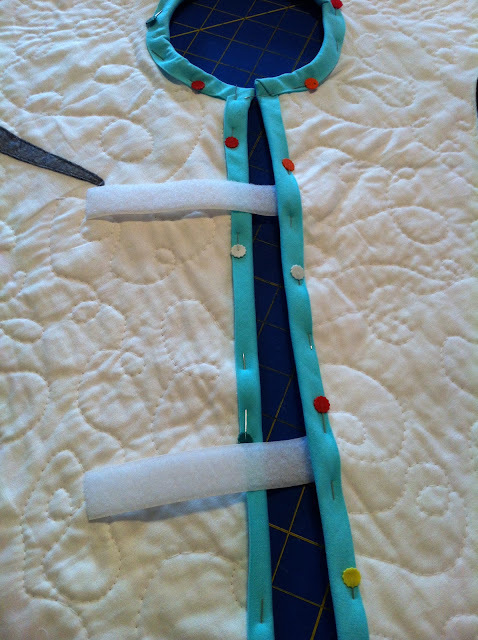 Turn it over to the back and line up the rough pieces of velcro so they are opposite the fuzzy sides on the opening. Pin in place and sew around all 4 sides of each piece, making sure you use white thread. You are done! Here's what mine looks like from the back with the velcro closed. Instead of buying a new piece of fabric for the back, I pieced mine with things in my stash. I could easily turn the tree skirt over if I wanted something a little classier. But then again, why would I? 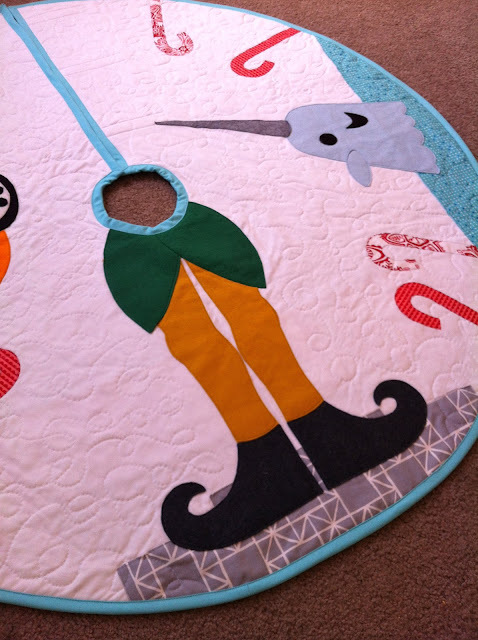 I may be buying a tree right after Halloween this year just so I can look at this tree skirt every day and smile. Smiling's my favorite. If you use this tutorial or the templates in any way, be sure to add your projects to the Holiday Craft Bash Flickr pool. 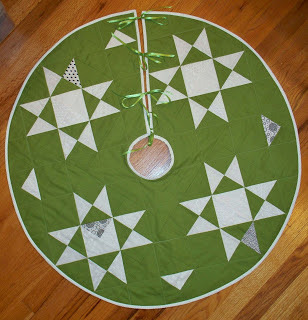 And keep an eye out this week for some more really beautiful tree skirt projects from my HCB friends. 1. 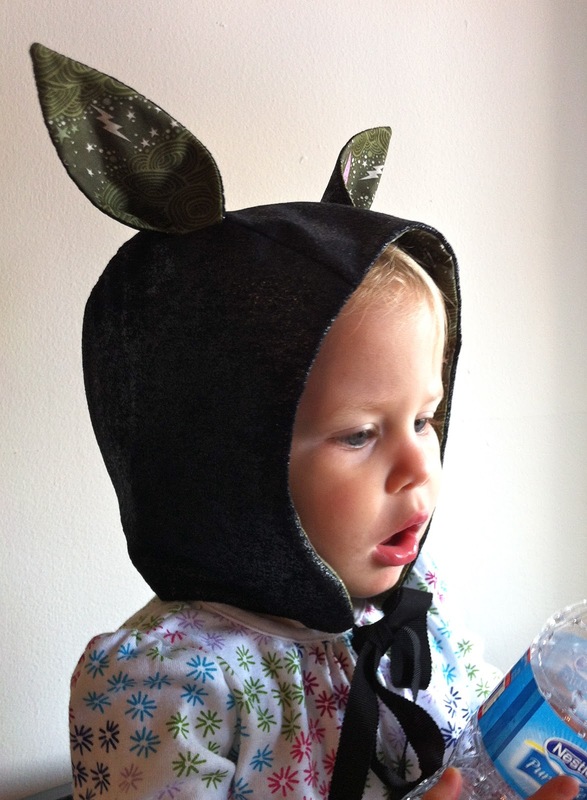 Today I'm over on Caila Made, talking about one of my very favorite fall patterns. Head here to see more and find out what the pattern is. (From my very favorite sewing book ever!) 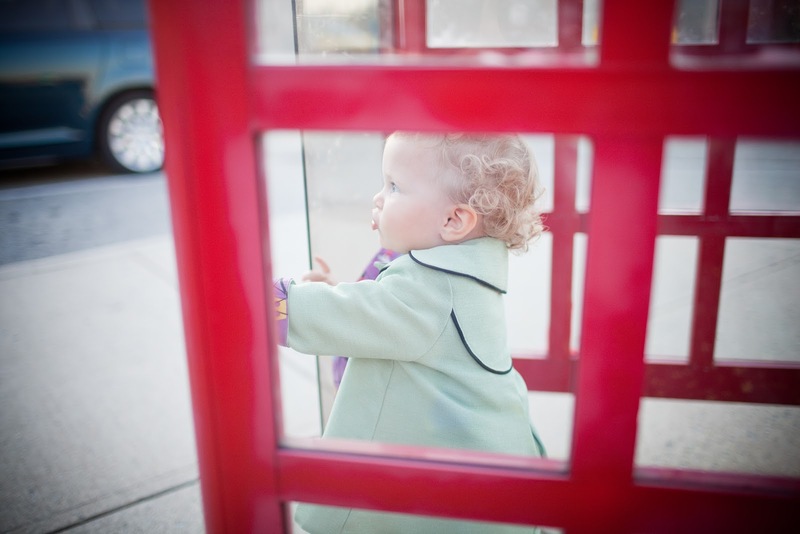 And if you don't know Caila, be sure to look around her blog. 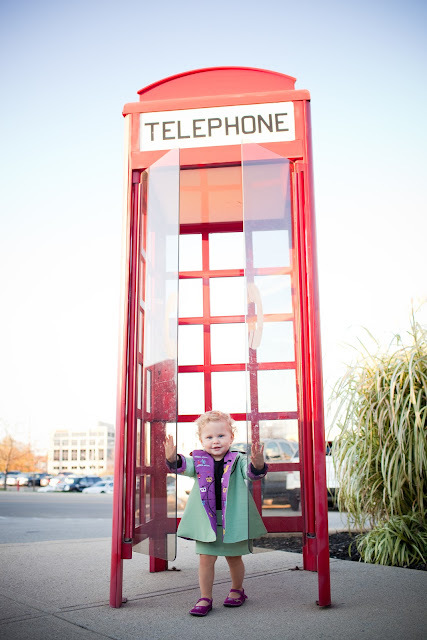 She is a really creative up-and-comer. 2. Today starts the voting on the Project Run & Play finale! Go and make sure you vote for your favorite. Such great stuff! 3. 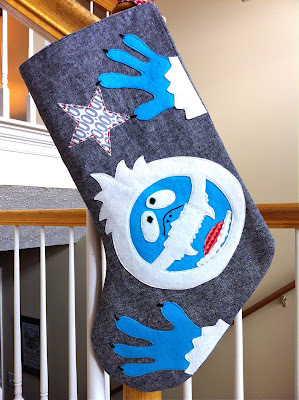 Did you catch all four stockings in the Holiday Craft Bash this week? 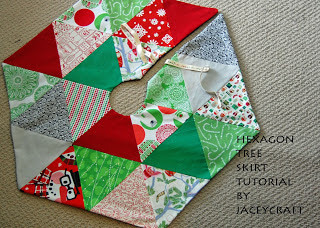 I'm working on my Elf-inspired tree skirt now, and will have the tutorial ready to share with you on Monday. 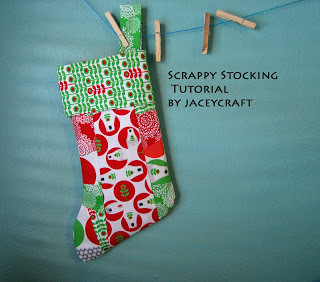 In the meantime, check out these great stocking tutorials, get inspired, and join the Flickr group for a chance at great prizes.